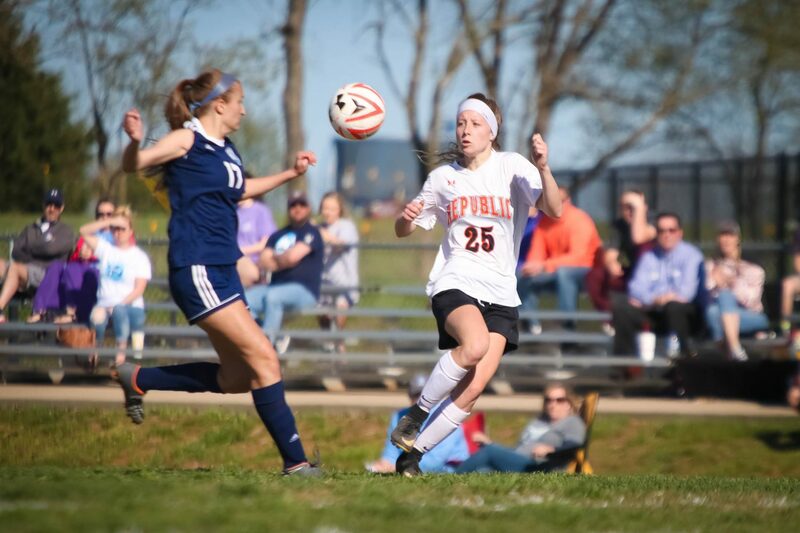 The Lady Tigers had plenty of chances to score in the first 80 minutes of play against Oak Park Friday. They didn’t finish those opportunities — but three minutes into overtime, Emma Pearce did. Pearce took a pass from Sarah Hicks and tapped it past the goalkeeper into the corner of the net for a 1-0 sudden-death victory. “I was getting really tired. We’ve already had two games this week, and we had a busy week last week coming back from Jeff City, so yeah, it was really frustrating us not to score,” Pearce says. At the end of regulation, coach Kevin Hauck told his forwards to stay higher to allow the midfielders more room to work, and it paid off with Pearce’s goal from the middle of the box. It was enough — just barely — as the ball rolled toward the right post, hit it, and rolled into the net before the Oak Park goalkeeper could recover. Goalkeeper Tara Campbell and the defense earned yet another shutout. The win improves Republic’s record to 10-5. The Lady Tigers travel to Branson on May 1. Emma Pearce was in the middle of the Lady Tigers’ attack all afternoon, but she waited until overtime to turn in the play of the game. Pearce crashed the back side of the box, took a pass from Sarah Hicks, and placed it into the corner of the net for a sudden-death victory. She’s our Farr Better Player of the Game.